After 2001 this is the second time that we visited the crown of the Statue of Liberty. In this article, I will reveal how the tour into the crown works exactly, how to get tickets for the crown of Statue of Liberty and if it’s all worth it. Enjoy our detailed review about the Statue of Liberty Crown tour. If you want to buy tickets for the crown of the Statue of Liberty, please head over to their official website. Tickets are limited and there are only 100 tickets that are being sold per day. With that being said I recommend buying your tickets for the crown of the Statue of Liberty months in advance. We are getting asked a lot if you can buy tickets for the crown of the Statue of Liberty on the day of your desired visit. This is not possible, unfortunately. You will have to apply in advance to receive the tickets for the day you are planning on visiting the crown. After purchasing the tickets you will receive an order confirmation which does NOT confirm your visit of the crown of the Statue of Liberty. Now they will check their capacities and then come back to you if your requested time slot window is available or not. Please note that a cardholder can only book a maximum of 4 tickets in a 6-month period and this person has to be present when picking up the tickets. If that’s the case you will receive an email with a confirmation number which you will have to show at the ticket office at Clinton Castle with your valid ID. How much does crown tickets for the Statue of Liberty cost? 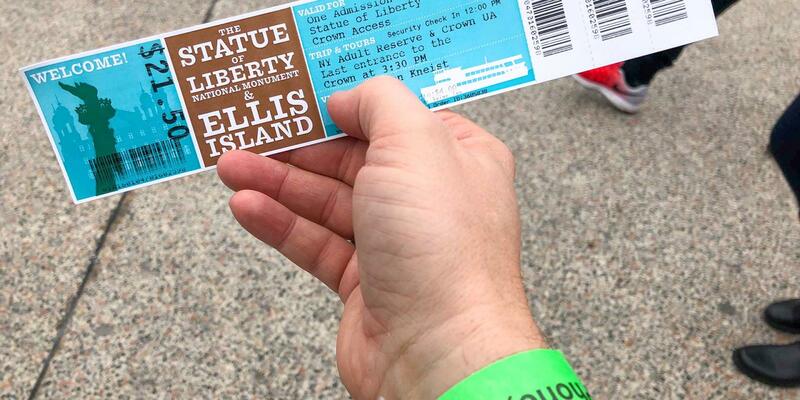 The cost of a Statue of Liberty Crown ticket is the cost of the Reserve ticket, which is USD 21.5. + USD 3 for access to Liberty’s Crown. If you are from 13 years to 61 years of age you need to buy an adult Statue of Liberty ticket. Kids under 12 years cost USD 12 and seniors from 62 years and above will have to pay a discounted rate of USD 17. Your way into the crown of the Statue of Liberty starts at Clinton Castle in Battery Park. This is where you will pick up your tickets. From there you will make your way over to the security checkpoint which is just as serious as the ones you’ll find at the airport. It also takes as much time as at the airport: Expect a waiting time from 15 min up to one hour. The Ferry to Liberty Island! After successfully passing the security control your next adventure is a fun ferry ride to Liberty Island where the Statue of Liberty is located. The ferry ride to Liberty Island takes about 20 minutes. Now you are wondering if the ferry ride to the Statue of Liberty is free? Yes, it is included in your ticket price. On the backside of the Statue of Liberty, you will have to pass another security check. There will also be lockers to store your backpacks and purses. They are not allowed on the Statue of Liberty. We encourage you to bring your camera, phone, medication if needed and something to drink though. Especially the fluids is something you will need for sure once you’re done with the climb into the crown of the Statue of Liberty. After security, you are entering the Statue of Liberty Museum, which is really interesting and offers great perspectives on the history of the iconic landmark. Soon there will be a new museum on Liberty Island, stay tuned for more information. First stop will be the pedestal of the Statue of Liberty after climbing 150 stairs to the top. 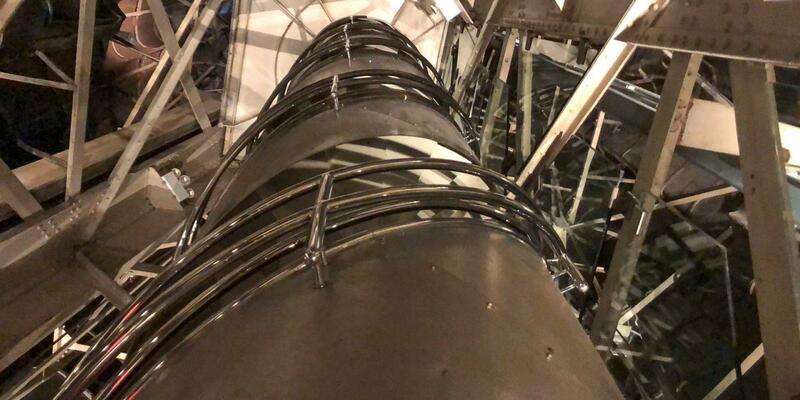 Just in case you are wondering if there is an elevator to the pedestal of the Statue of Liberty, yes there is an elevator in operation on Ellis Island from the first floor of the museum to the Statue of Liberty Pedestal. The view from the pedestal is amazing. You can see the skyline and are able to get a great overview of Liberty Island. Climbing the stairs was pretty easy and can be done with your little ones as well. Now things are getting interesting because climbing into the crown of the Statue of Liberty is a little bit like a workout. A total of 354 stairs are ahead of you. That’s the point where you will need the water you hopefully brought with you. Is it hard to climb the Statue of Liberty? Absolutely! Also, the stairs are really narrow so when you’re claustrophobic or are dealing with the fear of heights, this tour is not for you. Is it worth it visiting the crown of the Statue of Liberty? Honestly, it is a nice experience but not on our must-do list of the things you have to see in NYC. From our experience, it tends to be busiest at the crown in the morning and very quiet in the afternoon. What we really enjoyed about climbing the crown is getting to see the interior of the statue. Once you made it to the top, there are a few small windows to look out of. The view isn’t any better compared to the view from the pedestal either, because you’re looking through these tiny windows and your time up there is limited as well. You tried to purchase tickets for the crown and didn’t get positive feedback? Don’t worry, we have some ideas, what you could do instead. If you just want to visit Liberty Island you can purchase regular tickets for the ferry to Liberty Island. If you want to see Miss Liberty very closely consider one of the sightseeing cruises, or dinner cruises who take you super close to the landmark. If you only want to see Miss Liberty and don’t need to be super close to her, the Staten Island Ferry might be the best bet. Here’s everything you need to know. Der Beitrag Crown Tickets for Statue of Liberty erschien zuerst auf Loving New York.